photo-eye | BLOG: Book Review: William Eggleston Portraits. Book Review: William Eggleston Portraits. 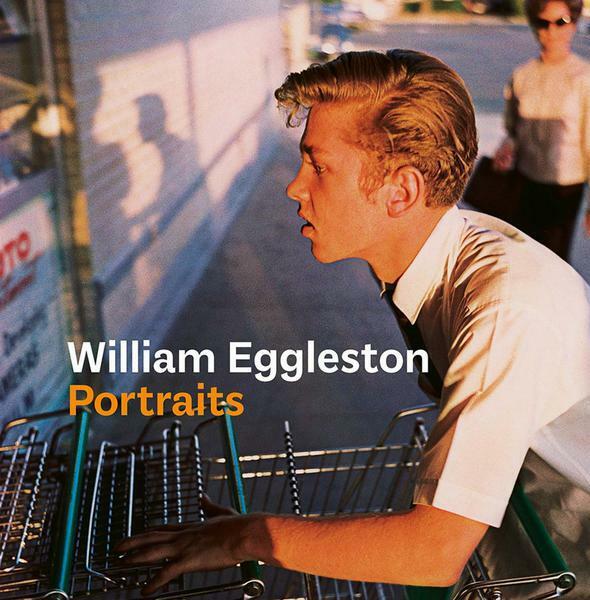 Book Review William Eggleston Portraits. By William Eggleston Reviewed by Blake Andrews Portraits is a beautifully printed selection of photographs from throughout Eggleston's career, in roughly chronological sequence. The theme is people, and the photos run the gamut from early black & white, through 5 x 7, film stills, informal candids, family photos, to outright oddities. By William Eggleston. Yale University Press, 2016. Photographs by William Eggleston. Text by Phillip Prodger. Yale University Press, New Haven, USA, 2016. 184 pp., 130 color and black-and-white illustrations, 10¾x11". One of William Eggleston's best-known photographs —currently on display at The National Portrait Gallery in London and enlarged to enormous scale— shows two men standing among dead leaves. Behind them is a pale sedan with door ajar; if you're an Eggleston fan you may be able to close your eyes right now and bring a mental picture of it into focus. The man in front is white, dressed in a black suit. Behind him stands a black man in a white jacket. They both gaze with empty expressions in the same direction off camera. Captioned , the photograph offers no direct evidence for what the men are looking at, or thinking, or what their relationship might be. Yet, as in many strong photographs, the absence of clear narrative invites the viewer to create his or her own story. The photo is in color, yet bears a strong formal whiff of monochrome duality which might be extrapolated to some artistic statement about the South. Each man seems engulfed in a private world. If we assume the black man is a chauffeur the postures of the two men critique race relations. Or do they? Maybe the men are engaged in a silent argument, or about to enter the car, or have just left it? Are they playing Simon Says Put Hands In Pockets? There's no way to know. That's the magic —some might say the curse— of photography. William Eggleston Portraits. By William Eggleston. Yale University Press, 2016. When the photo appeared originally in 1976 in Eggleston's Guide, its deadpan caption was no help interpreting: "Sumner, Mississippi, Cassidy Bayou in Background". For those who believe, as Winogrand did, that "nothing is as mysterious as a fact clearly described," the title leaned toward outright obfuscation. Oh well, one might shrug, that's Eggleston. Mumbling, lovable, inscrutable…at war with the obvious. Sure he's a charming character. But a portraitist? That may be a stretch. That understanding of Eggleston may be in for a change. The recent book Portraits (Yale, 2016) casts the master photographer and many of his images in a new light. Published in conjunction with the London show mentioned above —The Guardian's verdict: "Momentous, Trivial, Marvelous"— Portraits is a beautifully printed selection of photographs from throughout Eggleston's career, in roughly chronological sequence. The theme is people, and the photos run the gamut from early black & white, through 5 x 7, film stills, informal candids, family photos, to outright oddities. Roughly two-thirds have been published in other books. The rest are shown here for the first time. Through careful selection and recaptioning, Eggleston's photographs now offer something akin to personal revelation. OK, I admit that may be an overstatement. Eggleston-the-man still hides behind a regal facade, always dressed impeccably with plantation porch tumbler in one hand. But it turns out Eggleston-the-photographer has been revealing private moments the whole time, right under our noses. To date, they've been captioned discreetly as passing moments. With Portraits, Eggleston the secretive modernist has done a one-eighty and come out into the open. Not only does he wants us to know his subjects. He wants us to know him. The photograph discussed above is one such example. In Portraits, it appears with the title "Untitled 1969-70 (the artist's uncle, Adyn Schuyler Senior, with assistant and driver, Jasper Staples, in Cassidy Bayou, Sumner, Mississippi", a caption seemingly determined to impart as much information as possible. Many familiar photographs undergo a similar metamorphosis. A woman sitting on a patio, labeled only by location in Eggleston's Guide —"Jackson, Mississippi"— becomes a full-fledged person: "Devoe Money in Jackson, Mississippi". The anonymous redhead lying in the grass becomes "Marcia Hare in Memphis, Tennessee". The two young women photographed anonymously in the early 1970s on a couch have names too: "Karen Chatham with the artist's cousin, Lesa Aldredge." The woman in a yellow blanket from the cover of For Now? It's Eggleston's wife Rosa. The grinning teen in highback chair from Eggleston's Guide? His nephew Adyn Schuyler. Other family members including all of Eggleston's kids are identified by caption in the book, especially in the latter images. The overall effect is a view behind the curtain. Shown along with his earlier photographs, these recaptioned images reveal a new perspective on Eggleston. But again, they raise the question, is Eggleston a portraitist? For me, the jury is still out. To be sure there are some wonderful portraits here. For example, Eggleston's portraits of young people made with a view camera in the early 1970s capture private moments, personal detail, and a sense of the subject's interior. Likewise, his color photographs of close friends, for example, William Christenberry, TC Boring, Dennis Hopper, Eudora Welty, show a deft visual touch and sense of intimacy. But other photographs in the book might be considered portraits only in the very broadest sense of the word. Not every photograph of a person qualifies as a portrait, and this book proves it. For example, photographs caught on the fly snapping random anonymous characters seem closer to street photography than portraiture. Portraits has plenty such images, mainly from Eggleston's earlier monochrome career, but also later color shots. A photograph of a couple hidden behind a windshield or a woman's torso shot from the side, for example, tell virtually nothing about their subjects. By his own admission, Eggleston photographs such anonymous passers by the same way he might shoot a parking lot, a sign, or a lamp-post. There is no empathy, no engagement or connection, just documentation. Many of his so-called portraits show no communion or dependency on their subject. Instead, they are made despite them. One can collect these in a book and call it Portraits. And I suppose that when taken as a whole, such photographs might form a rough portrait of the rural South. But to label them all as portraits seems overly ambitious. With this book, Eggleston has once again left the door open about his aims. We have more information, but —as with most successful portraits— he remains somewhat inscrutable. If the photographs present questions, Portraits contains plenty of supplementary material to help flesh out Eggleston's character. Philip Prodger, head of photography at The National Portrait Gallery and curator of the selection, introduces the books with a lengthy and informative essay on Eggleston's portraiture. There's also the standard chronology, bibliography, and print information typical of museum tomes.